Welcome aboard! We've put together the following series of articles to get you off to a quick start with AdStage. If you have already connected your ad accounts, skip to Step 2. Your first step is connecting your ad accounts so data can pass from the native network into AdStage. This lets you create reports and automated tasks directly from the AdStage platform. We recommend connecting all of your ad accounts, so you can conduct true cross-network analysis. Step 1: To get started, open the Accounts page by navigating to the left-hand side of the AdStage screen and finding the Data Management Icon. Hover over the icon and select Accounts. Step 2: Click the "Connect" button. Step 3: Next, choose the network you would like to connect. 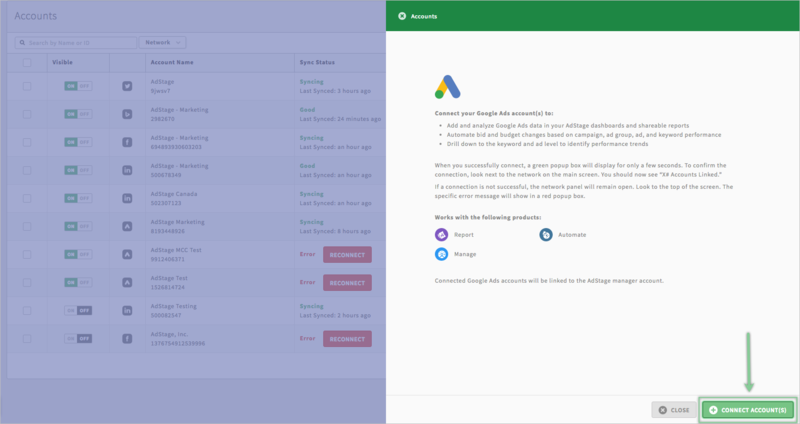 Step 4: Click the "Connect Account(s)" button, enter your account credentials, and accept the permissions (please accept all permissions, as it might lead to syncing failures if not). Step 5: Finally, a right-hand rail will slide out with a list of your ad accounts connected to the credentials you used. 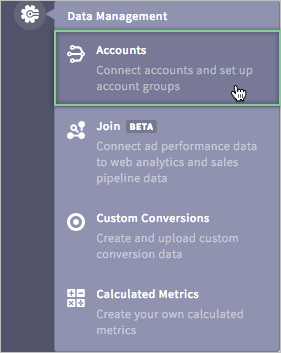 Select exactly which ad accounts you'd like to connect to AdStage. We'll then begin your account's initial sync. Note: there may be a delay between accepting permissions and the rail populating. Repeat these steps for as many networks as you would like to connect. You can also add more at any time by revisiting the Accounts page.